Although the Sun is 400 times larger than the Moon, yet it is also about 400 times as far from the Earth than the Moon. This situation causes the two luminaries (Sun and Moon) to appear as about the same size in the sky. When the Moon passes between the Sun and the Earth, it casts a shadow. If this shadow falls on the earth, it causes an eclipse. The Moon passes between the Sun and Earth every month, yet it does not cause an eclipse to occur every month. An eclipse can occur only when the Moon is zero latitude i.e. it is in the plane of the orbit of the Earth around the Sun. The points of intersection of the orbital planes of the Moon (around earth) and the Earth (around Sun) are called Rahu and Ketu. Rahu is the ascending node i.e. the turning point where the Moon begins to gain latitude and Ketu is the descending node of the Moon. Naturally, for an eclipse to occur, the Sun and Moon would appear to conjoin in the skies, and it is necessary for either of the nodes to be in contact for the shadow to fall on Earth. Since the shadow can fall on Earth only when either of the nodes conjoins this conjunction of the luminaries, the nodes are also called shadowy planets or shadow causing by nature. This is referred to a Maya. Published in The Jyotish Digest, 2003Sanjay RathThis is an old paper published in The Jyotish Digest, 2003. It gives valuable inputs from the teachings of Varahamihira about Eclipses and their effect on human lives. In addition, you may like to download the BAVA conference papers and recordings of 2010 from this website. We shall be very grateful if you consider making a suitable donation to BAVA or at least taking an annual BAVA membership to support the cause of Jyotish. The orbits are not circular and instead, are elliptical (egg shaped). Therefore, the distance between the Earth and the Sun changes as the Earth revolves around the Sun, and the same thing happens as the Moon revolves around the Earth. Thus, a number of possible combinations of distances can occur when the eclipse occurs. The shadow of the Moon has a dark portion called the umbra and a lighter shadow called the penumbra. If the umbra does not fall on the Earth, a partial or annular eclipse occurs while if the umbra falls on earth, then the region of the shadow is able to see the total eclipse. The difference between a partial and annular eclipse is that during an annular eclipse, the Moon’s disk appears smaller than the disk of the Sun although it passes directly over the Sun. In a partial eclipse it does not pass directly over the Sun but covers a portion. The annular phase of an eclipse can only be seen from a very narrow track called the path of annularity. The eclipse of 31 May 2003 was an annular eclipse. Fred Espenak adds, “The event transpires near the Moon’s ascending node in central Taurus five degrees north of Aldebaran. Since apogee occurs three days earlier (May 28 at 13 UT), the Moon’s apparent diameter (29.6 arc-minutes) is still too small to completely cover the Sun (31.6 arc-minutes) resulting in an annular eclipse.” The star Aldebaran is in Rohiëi nakñatra and the reference to the occurrence of the eclipse in ‘central Taurus’ affirms the use of the sidereal (vedic) zodiac, which is the correct way of looking at the sky. If instead, the tropical (western) zodiac were used, the eclipse would have been said to occur in the beginning of Gemini. Rule 1.2 There are ten types of eclipses based on the appearance and movement of the shadow on the disc of the Sun (or Moon). It should be borne in mind that the lunar eclipse is due to the Moon entering the shadow of the earth causing the eclipse to begin in the eastern limb, whereas the solar eclipse is due to the Moon covering the solar disc, which causes the eclipse to begin from the western limb3 . The Moon moves into the solar disc like a cloud from the west. Consequently, the solar eclipse is different in different places based on the visibility of the eclipsed disc4 . Savya: Partial eclipse of the southern side of the solar disc or the south-eastern part of the lunar disc. Such an eclipse causes heavy rains and floods but the people are happy and fearless. Apasavya: Partial eclipse of the northern side of the solar disc or the north-western part of the lunar disc. Many deaths occur die to the tyranny of rulers and robbers alike. Leha: lit. Licking and this is a total eclipse where the tongues of darkness seem to lick the disc or enclose it like a ring. A very benevolent eclipse where there is sufficient rains and water and general happiness is assured. Grasana: lit. Swallowing. This is a partial solar eclipse where the solar or lunar orb is swallowed (covered by a dark shadow). At least one powerful leader shall die and prosperity shall decline. Even the most powerful nation shall see the troubles of an economy under recession. Nirodha: lit. Obstruction. This is a total eclipse where the central region/solar or lunar orb is completely dark and opaque. A benevolent omen promising well-being and happiness in the region. Avamardana: lit. Crushing. This is a total eclipse that is long lasting (duration). It causes destruction of world leaders and nations and is considered very inauspicious. Āroha: lit. Mounting. If after the eclipse, there follows a period where the luminary is again covered by a spell, however brief, of darkness. This is an evil omen and portents war, panic and a lot of fear. Āghrāta: lit. Smelting. The shadow is partially transparent and appears as a layer of dust over the luminary. This is a very good omen and promises good rains, crops and prosperity. Madhya-tamas: lit. Central darkness. This is a clear annular eclipse where the dark central shadow is surrounded by a ring of light. This is an evil omen and will destroy people and afflict humanity with disease. 10. Tamontya: lit. Edge darkness. This is a total eclipse where the central region seems lighter as the outer part of the shadow is very dark. Food shortages, crop destruction and danger from thieves or great losses are indicated by this eclipse. It is possible that an eclipse may not be of one of these pure types but a mixture of several of these. The observation and results have to be carefully deciphered. Secondly, this is a very subjective reading and one should not rely totally on it. Rule 2.5: The regions in which the eclipse is visible at the time of rising or setting (sandhyä), would face financial pressures due to poor agriculture and there would be danger or ill-health to the political leaders and government. This rule is applicable only to those regions where the eclipse is visible at sunrise or sunset. The regions include Arabia, Libya, most of Europe excepting the east and parts of Canada and USA. The financial strain would show in the months to come till November 2003. Moreover, the pressure would increase in the regions from Arabia to West Europe while the pressure will decrease in Canada and the USA indicating some recovery from recession for America. Since this region is outside the main shadow, the financial strain will not be as much as what Scotland, Greenland and Iceland are going to face. Refer to the stereographic projection map of the eclipse path (courtesy Fred Espenak, NASA). Rule 3: If the eclipse occurs during uttarāyana, then the Brahmin and Kṣatriya will suffer while in dakṣināyana the vaiśya and śūdra shall suffer. Uttara ayana is from Makara saṅkrānti (14 Jan) to Karkaṭa saṅkrānti (15 Jul) covering the last half of January, February, March, April, May, June and the first half of July. Dakṣiṇa ayana is from Karkaṭa saṅkrānti (15 July) to Makara saṅkrānti (14 Jan) covering the last half of July, August, September, October, November, December and the first half of January. 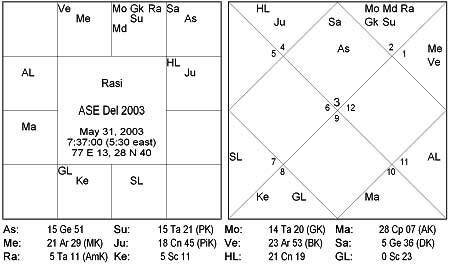 These are the vedic sun signs which actually align with the stars unlike the western sun signs which are not going to align with the sky for a few thousand years. Ask anyone at NASA if you doubt this statement. 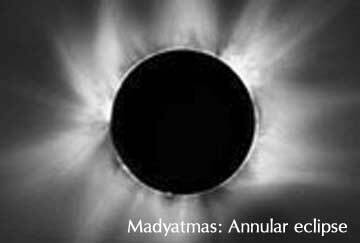 The annular eclipse of May 2003 is during the northern course of the Sun (uttarāyana) indicating that the learned ones and the warriors, police etc., shall suffer the impact in those nations where the shadow of the eclipse passes. 4.1: If the eclipse is seen (visible) in the four cardinal directions, then the four classes of people Brahmin (north), Kṣatriya (east), Vaiśya (west) and Śūdra (south) shall suffer. 4.2: If instead, the eclipse is seen in the corners, then for northeast – mleccha, southeast – attacking army, southwest – engineers, fire users and northwest – skilled workers shall suffer. There are two kinds of directions used in jyotiṣa – (1) the directions of the signs with the two alternatives of (a) triplicity: where fire signs indicate east, water signs indicate north, air signs indicate west and earth signs indicate the south directions, and (b) natural directions where Aries & Taurus are east and so on, and (2) the directions of the houses based on the lagna indicating east, 10th house indicating south and so on. It is obvious that Varāhamihira is referring to the second method of determining the direction based on houses. If it were not so, then the results would be the same for all parts of the world. For example, the annular eclipse of May 2003 occurred in Taurus. If we were to use the direction indicated by the sign then this will indicate the south (triplicity) or east (natural) for all parts of the world. Instead it is better to draw a chart for the time of first visibility of the eclipse and determine the directions accordingly (Chart-1). Local circumstances differ and the first visibility of an eclipse varies from one place to another. Besides, the eclipse is not visible in some places and this rule shall not apply to such places. 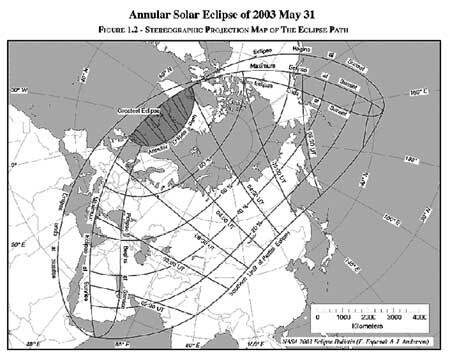 For example, the shadow of the annular solar eclipse of May 2003 does not pass through Delhi, hence only the penumbra causes a partial shadow to start at 7:37’ AM (2.07’ UT) and visibility lasts till 8:31’ AM (3:01’ UT). For other cities, information can be had from NASA6 . The Lagna at Delhi is Gemini and the eclipse is in the 12th house indicating the southeast direction. The reading would be that all hostilities in the border regions, aggressive armies of neighbouring countries, terrorists etc, will withdraw and good relations will be resumed with neighbours. Rule 6: The impact of the eclipse occurring in the twelve signs should be examined based on the nature of the sign as taught by Varāhamihira (Bṛhat Saṁhitā V: 35-42). The annular eclipse of May 2003 occurs in Taurus indicating that shepherds, cattle, livestock, ranchers, and great self-made men shall suffer. In individual horoscopes, the Lagna or tenth house/lord in rāśi and dasāṁśa should be examined. People born in Vṛṣabha navāṁśa lagna also need to be on guard. The eclipse of May, 2003 occurs in the amāvāsya of the lunar month of Vaiśākha. The destruction of cotton, sesamum and green gram is expected to follow resulting their shortage and price rise. The Ikṣavākus, Yaudheyas (modern Yādava), the Sākas and Kaliñgas would stand to suffer. However, there will be good crops in the ensuing months. Rule 7: Results of the Vedic month of eclipse should be learnt from Varāhamihira (Bṛhat Saṁhitā V: 69-80). The eclipse will impact the health and/or life of people born in the same month as that of the eclipse (especially when the eclipse is in the same nakṣatra as natal Sun). It has been observed that the effect of the eclipse can be felt before or after the eclipse date based on whether the eclipsed luminary is before or after the natal position. whereas if the longitude of the natal Sun is higher than the longitude of the eclipsed Sun, the event would happen before the eclipse date. Exact timing will have to be done with daśā in the natal chart, but this is an important tool for confirmation. 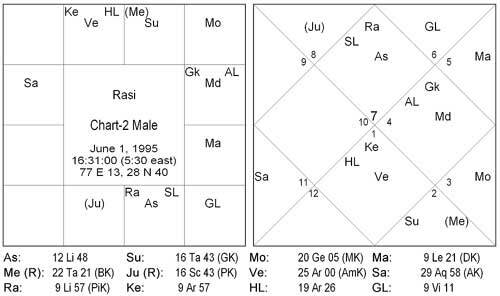 This is applicable only for natal charts where the eclipse (Sun) is in the same nakṣatra as the natal Sun. However, one must also see the lunar eclipse as given in the research notes under Rule-09 hereunder. 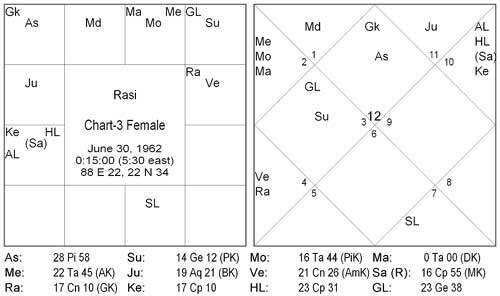 In Chart-2, the natal Sun is in Rohiṇī nakṣatra at 16-43 and the eclipse was to occur on 31 May 2003 when the Sun was in Rohiṇī nakṣatra at 15-21. Just three days before the eclipse the child broke his hand while playing in the garden. Note that the natal sun is ahead of the eclipse degree and the event was to happen before the eclipse date. Rule 8.7: An eclipse, whether visible or not, affects the entire world. 8.7A: The length of the day or night duration is divided into seven parts. (1) Engineers, people whose work uses fire like goldsmiths, Brahmins, priests (agni-hotri), hermits. (2) Agriculturists, heretics, traders, warrior class and army chiefs. (3) Artisans, artists, çüdras (cleaners etc), mleccha (including foreign visitors /dignitaries) and ministers. (4) The king (head of state); region – middle portion/region of the country. (5) Herbivorous animals, harems, ministers, vaiçyas (merchant class, business). (7) Robbers, rogues; region – the country border. The timing used in this calculation is the ‘actual astronomical occurrence’ and not local visibility. For example, the Annular Solar Eclipse (31 May 2003) was not visible in Australia, yet it shall affect Australia based on the rule given above. (c) eclipse ends i.e. shadow leaves the earth. The class of people, places and things indicated by the portion shall accordingly (a) suffer, (b) be destroyed and (c) benefit, respectively. The annular eclipse begins in northern Scotland about 100 kilometers north of Glasgow when the Moon’s antumbral shadow first touches down on Earth at 03:45 UT. The instant of greatest eclipse8 occurs at 04:08:18 UT when the axis of the Moon’s shadow passes closest to the center of Earth. As it departs Greenland and crosses Baffin Bay, the shadow leaves Earth’s surface at 04:31 UT. From start to finish, the antumbra sweeps over its entire path in a little under 47 minutes. New Delhi: The eclipse starts on Saturday, at 9:15’ AM, has a peak (greatest eclipse) at 9:38’:18″ AM and ends at 10:01’ AM. Sunrise: 5:24’:54″ and Sunset: 19:13’:26″. It is evident that the eclipse (start) time of 9:15’ AM is in the second part indicating that agriculturists, heretics, traders, warrior class and army chiefs stand to suffer during the six months till November 2003. 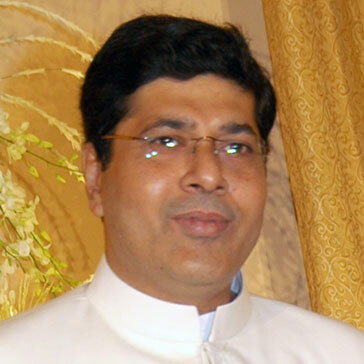 Incidentally, the Minister for Agriculture at New Delhi, Çré Ajit Singh, has just about resigned and has been replaced. The eclipse (end) time of 10:01’ AM is in the third part indicating that Artisans, artists, çüdras (cleaners etc), mleccha (including foreign visitors /dignitaries) and ministers shall benefit during the six months till November 2003. Washington D.C.: The solar eclipse starts on Friday 30 May 2003, at 11:45’ PM (23:45’) and ends on Saturday (Friday night – Vedic day) at 00:31’ AM (24:31’). The eclipse starts in the third part of the night indicating that artisans, artists, çüdras (cleaners etc), mleccha (including foreign visitors and dignitaries) and ministers shall suffer during the next half year till November 2003. The eclipse ends in the fourth part of the night indicating that the President George Bush Jr. (the king or head of state) is surely going to get some very good news and shall benefit considerably in the next six months. The central states of the country shall also benefit. Moscow: The eclipse starts on Saturday, at 7:45’ AM and ends at 8:31’ AM. Thus, the eclipse starts in the first part of the day indicating that engineers, people whose work uses fire like goldsmiths, Brahmins, priests (agni-hotri), teachers, researchers, spiritualists and hermits shall suffer losses. The eclipse ends in the second part of the day indicating that agriculturists, heretics, traders, warrior class and army chiefs stand to benefit as there is a renewed impetus towards increasing food and business giving a fillip to the economy. Rule 9: Two consecutive eclipses of the Moon and Sun normally occur within a month. If the solar eclipse were to occur at the end of the pakña (fortnight) after the lunar eclipse, then the people in general tend to become unruly and unjust and couples quarrel and divorces/separation increases. In the reverse i.e. the lunar eclipse occurring after the solar eclipse, the Brahmins and priests increase their prayers and people are happy and contented. (b) spiritual growth, happiness and contentment if the lunar eclipse succeeds the solar eclipse. In chart-3, the natal Sun is in Ārdrā nakṣatra at 14Ge12’. The global solar eclipse occurring at this nakṣatra is on July 2, 2000. This is followed by a lunar eclipse occurring on July 16, 2000. It is not important that either the Sun or Moon position be checked for the lunar eclipse. 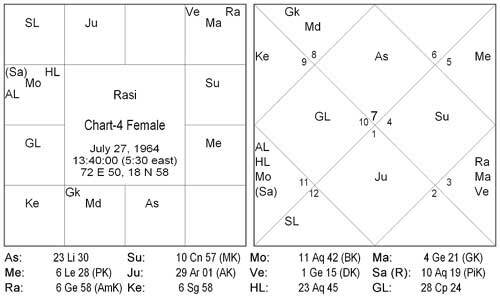 What needs to be ascertained is that the solar eclipse is in the same nakṣatra as the natal Sun. Since in this case, the lunar eclipse succeeds the solar eclipse, a period of spiritual growth, contentment and happiness is to come. True to the indications, she started serious studies in spirituality; regular visits to the Śāradā Mission (ladies wing of the Ramakrishna Mission) and also joined the Sri Jagannāth Center to learn Vedic astrology and spirituality. In chart-4, the natal Sun is in Puṣyā nakṣatra at 10Ge57’. The global solar eclipse occurring at this nakṣatra is on July 31, 2000. The eclipsed Sun was at 14Cn20’. This is preceded by a lunar eclipse occurring on July 16, 2000. As per Rule-09 and the research notes above, this indicates a very negative separative phase causing fighting, unrest and disturbances. Varāhamihira is explicit in stating that couples separate. She started fighting with her spouse on various grounds and they are headed for a separation. Of course, such predictions will also require that such indications are present in the natal chart and the daśā prevails. This eclipse factor is a tool to confirm the readings from the natal charts and should be used wisely. The instant of greatest eclipse occurs when the distance between the Moon’s shadow axis and Earth’s geocenter reaches a minimum.